Accessories – What’s In The Box? Up for review today is one of the best budget mechanical keyboards money can buy. Starting at $40, the Qisan Magicforce 68 is a compact 65% keyboard comparable to boards costing two or three times its asking price. However, the model being examined now is the slightly more premium version, which adds a white backlight and genuine Cherry MX (Brown in this example) switches. The cheaper model uses MX clones. The premium version, while not quite as budget friendly as the $40 basic model, is still a good value at the current price range of $60-$70; especially if you value real Cherry MX switches over the various clones. Is it worth the extra $30 over the non-backlit version with “inferior” switches? Read on to see the results. My Qisan Magicforce 68 (affiliate link) came in a generic cardboard box with small outer sleeve. Inside we find minimal documentation, the detachable Mini USB cable, a plastic ring keycap puller tool, the keyboard itself and a OTG adapter cable (allows the keyboard to be connected to mobile phones and tablets). There was no bubble wrap or padding material of any kind. Just some cardboard and the keyboard was wrapped in plastic, so your putting some trust in the seller to pack it securely. The Qisan Magicforce 68 is a compact 65% (mini form factor with arrow keys) white LED backlit mechanical keyboard with 68 keys in the standard ANSI layout. It measures 13.25 inches in length with a depth of just 4 inches and weighs in at 1 pound 4.2 ounces. It has a very small footprint that is more ergonomic than full sized boards, leaving plenty of room for your mouse while giving you comfortable access to the home row without having to shift your arms to the side. Yes, I flipped the spacebar upside down. That’s on purpose. All the keys, including the bottom row, are of a standard size. The smooth surface keycaps are sculpted OEM profile. It uses Cherry style stabilizers for the larger keys. This makes removing and replacing larger sized keys much easier. Cherry stabs also alter the key feel slightly, resulting in a less responsive action that makes stabilized keys feel slightly mushy compared to non-stabilized keys. Due to its compact size, many of the Magicforce’s keys have secondary functions. The number row and – + keys also function as the F keys. Keys Z through < act as media keys. The W, E, and R keys are used to change the polling rate (20, 40, or 60 C/S). Functions for Print Screen, Screen Lock, and Pause are under O, P, and [ (open bracket) keys. The Fn key + ] (closed bracket) opens the calculator. Pressing Fn + Q changes the way the Esc key operates. This is all detailed in a scan of the documentation posted below. Gaming on the Magicforce 68 won’t be hindered too badly as it features N-Key rollover. 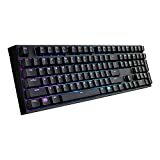 Gamers should be pleased with this board as long as you don’t require use of the F keys too often (they’re under a secondary function layer of the number row), but that’s the price to be paid with all of these compact form factor mechanical keyboards. If that’s a problem you may need to step up in size to a 75% or TKL (Tenkeyless) board with dedicated F1-F12 keys. On its underside the Magicforce has a cable routing gutter with tabs that securely hold it in place. This cable groove only allows positioning through the top middle, not out the left or right sides. Four flat rubber pads and two retractable, rubber tipped feet are attached for maximum traction. Despite its relatively small size and light weight, these feet do their job well. The keyboard isn’t easy to slide on smooth surfaces and will generally stay in place where you want it. The retractable feet also give the board a nice angle for anyone that prefers a bit of incline when typing. You’ll also find 3 DIP switches on the back. The first switch allows you to swap the Caps Lock and Left Control keys. The second swaps the Function and Windows Key. The third locks the Windows Key so it can’t be accidentally pressed and exit you from a game. A Windows Key lock is a essential feature for gaming so props to Qisan for adding it. Unfortunately, the board must first be unplugged before making changes to the DIP switches. This process can become quite a hassle over time. Maybe not for the key swapping features, as you won’t often be switching those back and forth, but you’ll need to constantly unplug the board and flip the DIP switch to make use of the Windows Key lock (unless you don’t require the Windows Key and just leave it in the locked position). A more elegant solution would have been to bind the lock to the secondary function of another key. The Magicforce 68 has no top shell, making it a floating key design. The exposed switches sit atop a silver colored aluminum mount plate (it’s also available in gold). The aluminum has a chamfered edge around its circumference that has been polished to an almost mirror finish. The polished edges contrast well with the aluminum’s sandblasted surface, which has a flat/matte finish. The white bottom shell is plastic and also has a matte finish. Being a floating key design, the switches and LEDs underneath are exposed. This gives the board a unique look that’s especially striking, as the LED backlights reflecting off the aluminum backplate are more apparent. This design trait is also functional. It makes cleaning and maintenance a much easier undertaking. The Magicforce logo is engraved into the aluminum on the right side of the board above the arrow keys. Personally, I would have preferred that area to be left blank. Or better yet, use the free space for a couple extra dedicated keys for Home and End that don’t require being under a function layer. The font used for primary legends is in a word, hideous. Thankfully there are no odd sized keys. It’s all standard, so finding a replacement backlit keycap set shouldn’t be too difficult. Though you will lose out on the secondary legends for the function layer. Other than a couple qualms, I still think it’s a visually alluring keyboard if you’re into the all white look. Also available in black if you’re not. Have a particular MX switch that’s your favorite? If so, it’s very likely to be available on the Magicforce 68. A premium model ($70) with backlit keys features authentic Cherry MX switches (Blue, Black, Brown, Red, Green, and White) and the budget model ($40) without backlighting uses popular MX clone switches (Outemu and Kailh). You can even get one with Gateron Clears for $60. The version being reviewed here came with Cherry MX Brown switches. A good all-around switch type that holds its own with either gaming or typing tasks. A real jack of all trades, master of none type of switch. It’s non-clicky with a small tactile bump and light actuation force of 45g. Browns have no hysteresis as the release point is the same as the actuation point, so gaming performance isn’t compromised. Makes for an ideal starter switch for users just getting into mechanical keyboards. As previously noted, the Magicforce 68 is held together with an aluminum top plate. Its surface has a matte finish that doesn’t attract finger prints. The bottom shell is plastic, but still feels very substantial with good rigidity when mated with the aluminum top. I felt no flex when applying moderate pressure to the middle and attempting to twist the board at each end. The keycaps are doubleshot ABS with translucent primary legends. Truth be told they are somewhat on the thin side. I have seen thinner, but they’re not thick by any means. The legends displaying secondary function of each key are pad printed in dark grey. This is a less durable method of apply legends and, unlike the primary legends, will fade with wear. The keycaps have a fairly smooth surface with very little texture. I don’t mind this personally, but it’s something to consider for users who prefer a rougher feeling keycap for grip. Keeping price point in mind, the overall keycap quality of the Magicforce 68 is adequate. That being said, a new set of PBT replacements down the road would be a wise upgrade if for no other reason than to have a normal, more aesthetically pleasing typeface. The detachable cable is a typical white USB to Mini USB with rubber sheathing, not sleeved or braided. It measures in with a total length of about 62 inches and has an average thickness. The ends are gold plated. Nothing special, but it matches the color scheme of the keyboard, is long enough to reach around my desk and gets the job done. A detachable cable is always a welcomed inclusion. If it’s not up to your standards or long enough for your setup you can always use your own custom cable. The Magicforce 68 comes with no software. Customization options are limited to the LED illuminations and what little changes can be made with the DIP switches we talked about earlier. Unfortunately, the backlight only has one mode besides the default profile (all keys lit), a breathing pattern that can be sped up or slowed down using the Fn + Right Arrow key. The backlight intensity is adjusted with Fn + Up/Down Arrow keys. The backlight can also be completely disabled. Speaking of the backlight, there is one aspect here I found very frustrating. The LED backlights will turn off if the keyboard is left idle for about 10 minutes without registering a key press. When it first happened I thought something might have broken, but once I started typing to test functionality the whole board lit right back up. Not a major concern, but the whole point of the backlight should be to see the keys in a dark or dimly lit room. Having to press a key for it to actually light up again is redundant. Maybe this “feature” can be disabled. If so, it’s not documented and I found no mention of how to do so. As for replacing stock keycaps, all switch types used with the Magicforce 68 line have MX style, cross-shaped stems. The keys are also all of a standard size (bottom row included), so you should have no issues installing aftermarket keycap sets or custom artisan keycaps. The Qisan Magicforce 68 is a well designed, solidly built 65% mechanical keyboard. That’s not so uncommon. What sets it apart from the rest is it can be had for as cheap as $40 if you don’t mind MX clone switches or the absence of LED backlighting. That’s insane value compared to other similar mechanical keyboards of this size and form factor. Sometimes it seems the smaller the keyboard, the greater the price. The more expensive Magicforce variants, even at nearly double the cost, are a better deal than most 60-65% boards. Check for yourself. Shop around and try to find a compact mech with Cherry MX switches, LED backlit keys, decent quality doubleshot keycaps, aluminum backplate, standard key sizes, a floating key design and pleasing eye appeal. The list is short and practically nothing but keyboards costing $100+. The Magicforce 68 isn’t perfect. It has flaws, but they aren’t major issues that will be deal breakers for most. It may not be special in any one specific way, but the board as a whole is greater than the sum of its parts. Extremely good value for the money. No top shell makes for easy cleaning. Row of useful media keys under a secondary function layer. Attractive floating key design accentuates the LED backlighting. Well built with a solid aluminum top plate and rigid bottom shelf. DIP switches allow for some key swapping/customization and the ability to lock the Windows Key. Available with a large selection of switch types, including genuine Cherry MX. Ergonomic layout and small footprint leaves plenty of space for your mouse. Standard sized keys and bottom row allow for easy keycap replacement. Backlight options are minimal and the LEDs automatically turn off if idle for more than a few minutes. Keyboard must first be unplugged before enabling the Windows Key Lock feature with the proper DIP switch. In my opinion the “gamer” inspired typeface used for the primary legends is garish and cheap looking. Large switch selection for every budget (Gateron, Cherry MX or Outemu), LED backlighting with floating-key design provides striking visual appeal, and generally excellent build materials combined with a fantastic form factor. In my opinion the Outemu switch version (non-backlit) is the best mechanical keyboard under $50. As of writing this review the Qisan Magicforce 68 is available from Amazon in a variety of Cherry MX, Outemu, and Gateron switches. I have a question about the polling rate. What does C/S mean? So for maximum response setting, 60 C/S would be ideal? Is it close to 1000hz? I believe C/S refers to characters input per second. I’m not 100% sure how that relates when compared to polling rates measured in Hz/ms, but my guess would be 20, 40, and 60 C/S is 125, 500, and 1000 Hz. That’s just my own assumption though.